Tyler Wells continued to turn heads for the Lookouts tonight, lowering his Southern League ERA to 1.67. Also, in an E-Town win, Gilberto Celestino hit his first homer since joining the org, Akil Baddoo reached safely four times in a Cedar Rapids victory and Alex Kirilloff hit his 18th home run of the season. Come check out what else happened around the minor leagues Saturday. Also, Jordan Balazovic was placed on the Kernels’ DL and it was reported that Michael Pineda’s rehab assignment has been put on hold due to concerns over some soreness in his knees. Rochester scored all three of their runs on a two-out rally in the fifth inning. It all started with catcher Juan Graterol drawing a walk. Alex Perez followed with a single, which chased Syracuse’s starter from the game. Byron Buxton was hit by a pitch to load the bases, then Nick Gordon drew an RBI walk. Gregorio Petit capped it off with a two-run single. D.J. Baxendale had an impressive night, striking out four of the six batters he faced over 1 2/3 scoreless innings. John Curtiss struggled some with his control, throwing just 17 of his 33 pitches for strikes, but still picked up his ninth save. Buxton was 1-for-3 with a single, a hit-by-pitch and two strikeouts. He also threw out a runner at home to end the sixth inning. This game started out as a pitchers duel, with Tyler Wells absolutely dealing for the Lookouts. The first run of the game didn’t come until the top of the eighth inning when Jacksonville took a 1-0 lead. Things got real interesting from there. Chattanooga responded with four runs in the bottom of the eighth, but their bullpen could not make that lead hold up, as they surrendered four runs right back to Jacksonville in the top of the ninth. Andy Wilkins delivered the big hit for Chattanooga, hitting a go-ahead, three-run homer with two outs in the eighth. Circling back to Wells, after six innings of shutout ball, his ERA is down to 1.67 since joining the Lookouts. He threw 63 of his 92 pitches for strikes and punched out seven batters. He’s given up just five earned runs in 27 innings for Chattanooga and has struck out 31 batters in the process. Griffin Jax had his worst start of the season and the Miracle could not recover. Jax tied a season high with four earned runs and issued four walks in a start for the first time in 24 professional appearances. Alex Kirilloff hit a home run, his fifth with the Miracle and 18th overall this season. Adam Bray pitched the final three innings, giving up one run on two hits to go along with three strikeouts. The Minneapolis native and South Dakota State product has a 1.27 ERA in 17 games with Fort Myers. The Kernels had two runs on the board before they even made an out in the bottom of the first inning and cruised to victory. Leadoff man Akil Baddoo filled up the stat sheet, reaching base four times. He also stole his 22nd base of the season. A quartet of 2018 draftees had big games as well. First-round pick Trevor Larnach was 2-for-4, pushing his batting average since joining the Kernels to .310, and drove in two runs. Michael Helman, an 11th-round pick, was 2-for-5 with a double and is hitting .368 in 19 games with Cedar Rapids. Michael Davis, selected in the 24th round, hit a two-run homer, his seventh with the Kernels. Finally, 31st-round pick Zach Neff logged 2 2/3 scoreless innings of one-hit ball to go with three strikeouts in his Midwest League debut. E-Town jumped out to an early 4-0 lead and fended off multiple comeback attempts by the Pirates to improve their record to 36-26 this season. Josh Winder put together a solid start and Yunior Severino socked a two-run homer in the second inning. Gilberto Celestino, acquired in the Ryan Pressly deal, hit his first homer since joining the Twins and finished 3-for-4 with three RBIs. Erik Cha, making his Appy League debut, inherited a one-run lead with one out and a runner on in the seventh inning. He gave up one hit and one walk over 2 2/3 scoreless innings to earn the save, striking out five of the 11 batters he faced in the process. Michael Montero entered this game with one out in the top of the 10th inning, after the Red Sox had scored the go-ahead run. He got out of a jam, recording the last two outs with runners on first and second base. Charles Mack tied it back up with a sac fly in the bottom of the 10th, and Montero just kept cruising. Despite having a runner start on second base each inning, Montero posted zeros in the 11th, 12th and 13th innings. Finally, in the bottom of the 13th Hunter Lee hit a walk-off single. Shane Carrier hit a three-run homer with two outs in the seventh inning. 3. Brusdar Graterol (FM): Did not pitch. 5. 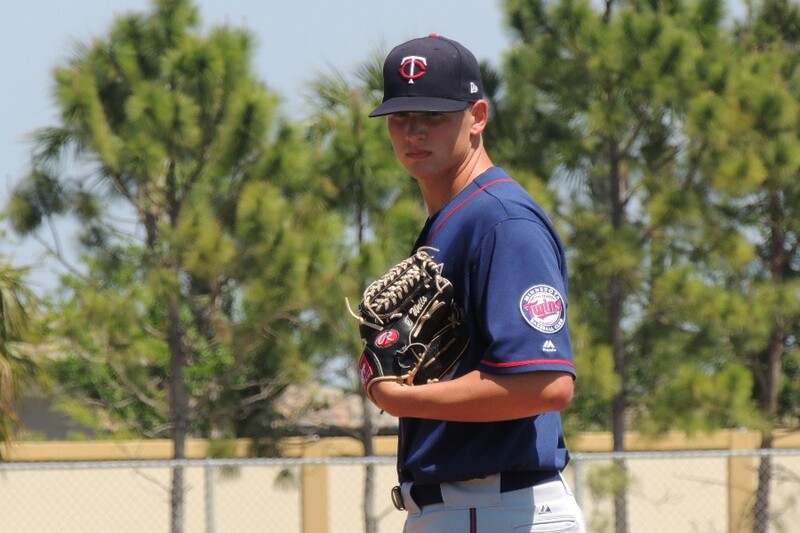 Stephen Gonsalves (MIN): Promoted to the Twins. 10. Zack Littell (ROC): Did not pitch. 11. Blayne Enlow (CR): Did not pitch. 12. LaMonte Wade (ROC): Did not play. 14. Lewis Thorpe (CHAT): Did not pitch. 17. Lewin Diaz (FM): Out for the season. 18. Ryan Jeffers (CR): Did not play. Tyler Wells (unless I’m mistaken) has the best pitching numbers in the entire organization. Supreme steal of a draft. I hope he goes to Arizona and big league spring training. Time to push him a little. Tyler Wells also turns 24 today (Sunday)! Happy birthday to him. I feel like we should be talking more about Michael Davis. Later round pick in June, but quickly moved up to Cedar Rapids and has shown power, despite a low-ish batting average, while playing a solid shortstop. I hate to say it, but Buxton's two Ks really stood out to me.He still does not have control of the strike zone and if he is like this in AAA he is not ready for MLB.Is Buxton really a great fielding AAAA player? It's easy to get stuck thinking only the "top prospects" are actually prospects, and maybe forget how many players in the big leagues never got that sort of attention as minor leaguers. A lot of it maybe speaks to the volatility of it all, but it is a little remarkable that Wells isn't a top 20 Twins prospect. Not a criticism of the evaluators, just that things change fast, and when you don't start as a high draftee it is harder to get taken seriously. Its not going to change, but in some ways it is almost silly that so much perception of who these guys can be comes from before they actually started playing professional baseball. I have to say the more success Tyler Wells has here in AA, the more I think he can be a great addition to the Twins rotation as soon as next year. I would have thought he’d struggle as the hitters in AA are much more advanced than A+ ball hitters. But instead Wells is pitching BETTER than he did in Ft Myers (and he has also maintained his great control/command). I think he’ll surprise a lot of people when he gets to the Bigs. Just remember, Andy Pettit and John Smoltz were 22nd round picks. Also, happy birthday to Brusdar Graterol. Maybe the Twins need to look at birthdays when they draft pitchers! Seems to me Wells has not seen much decline in his results as he moves up in levels.In fact, it seems like his results are improving.I am impressed with him. Eh, he has a 6/39 K/BB ratio as a 22 year-old in low-A. Doesn't seem like he's done anything to change his prospect status. Any word on why Balazovic was DL'ed? I’ve noticed that none of the players we received from trade deadline deals are shown as Top Prospects even though they were shown in the MLB Twins Top 30 Prospects for 2018. Some of them are doing very well, maybe better than some of the players on our normal list. Im not complaining, just something to consider going forward. I hate to say it, but Buxton's two Ks really stood out to me. He still does not have control of the strike zone and if he is like this in AAA he is not ready for MLB. Is Buxton really a great fielding AAAA player? I’ve never understood why Buxton doesn’t mix in drag bunts. With his speed he could add double digits to his BA. As I recall he came to us injured. Alcala has had 4 starts and he’s rocking a 6+ era with 12 walks to 17 k.
Maybe he needs to be shut down. Season is almost over anyway, though. He was the Astro's #7 prospect, and now ours at #11. He came to us with some kind of injury question and has pitched all of 15 innings. Rumor is he can touch 100 MPH. I don't see any need to panic. Not really panicking lol. I just don’t see what’s there besides speed. He walks a ton, and when he does put it in the zone he gets hit. And that goes back for two seasons. I’m a fan of pitchers, not the radar gun. That’s all I’m saying. That being said, he’s ours now and I hope he is great! In the mean time Tyler Wells deserves the top 30 and he isn’t in it for some reason. Let's just say Fangraphs isn't as high on him as others.....the rankings aren't universally agreed upon. And, I've quit caring about age to level of competition. It' silly for four-year college guys, especially in their first year of ball. Tyler Wells is a top 20 for me. Was at the midseason. Dude's got a chance. Ratings also don't have a ton to do with statistics and performance, but instead about upside... so rankings are always just for fun and for discussion... it's a projection. I don't think anyone says it's "reality." Could the Twins Extend Alex Kirilloff or Royce Lewis?